We worked closely with Ciputra Group, one of the biggest property developer In Indonesia, to find an environmentally friendly solution to their erosion problems at CitraGrand Cibubur, the first-class residential area skirted by the River Cikeas. Some of our key products, including Gabions, Reno Mattresses, Terramesh® System and MacMat® EM, were used to develop a customized solution to deliver effective erosion control and prevent future landslides. CitraGrand Cibubur is Ciputra’s large-scale luxury residential development integrating a modern business centre within a natural and clean-air environment in West Java, easily accessible from Jakarta and Bogor. 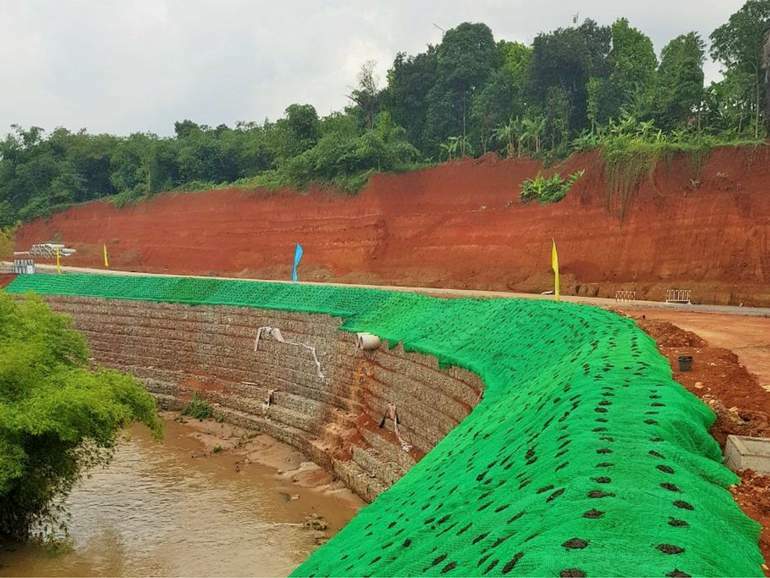 The developer needed an erosion control solution to protect the access road along the River Cikeas, which runs close to the residential area. Progressive road failures were occurring for the combined erosive actions of river and heavy rainfalls, which were saturating the clay soil of the slope. A slope retention structure was necessary to avoid that a landslide could harm the housing area and guarantee the safety of the residents. As slope protection specialists, we worked closed with Ciputra to develop a cost-effective, environmentally friendly and customized solution. Our proposal was a 3.5 m high gabion wall to support the unstable slope with Reno Mattresses at the toe of the gravity structure for scour protection. In addition, a 7 m high reinforced soil structure was added at the top of the retaining wall, using our Terramesh® System, which combines the flexibility of soil reinforcement with the benefit of a modular system. Our MacGrid® WG geogrids were used as primary reinforcement, enabling the soil to perform better than it would in its unreinforced state so that the structure can accommodate greater loads and stand at steeper angles. As a long-term erosion control solution, to facilitate the re-establishment of vegetation on the upper part of the slope, our MacMat® EM was also installed. This is a three-dimensional erosion control mat consisting of a UV stabilized polymer core. Upon heavy rains and water flows, the reinforcing ability of the mat prevents erosion and retains the otherwise vulnerable vegetation. Once vegetated, the mat reduces runoff velocities and discharge. All the stability checks for our retaining structure were performed using our MacSTARS® W software. These were performed under both static and seismic conditions. Furthermore, the stability during soil excavation and construction phases has also been verified. We provided the Client with jobsite supervision and the Contractor with installation assistance in order to ensure that the highest construction and installation standards were followed. The construction works of the retaining wall were completed in around 4 months.